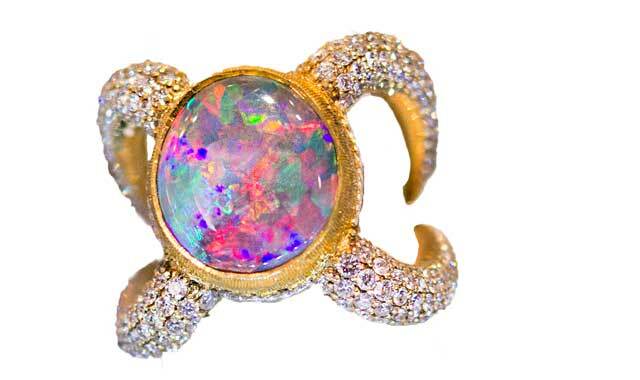 These locally owned fine jewelers know what she’ll want this holiday season. 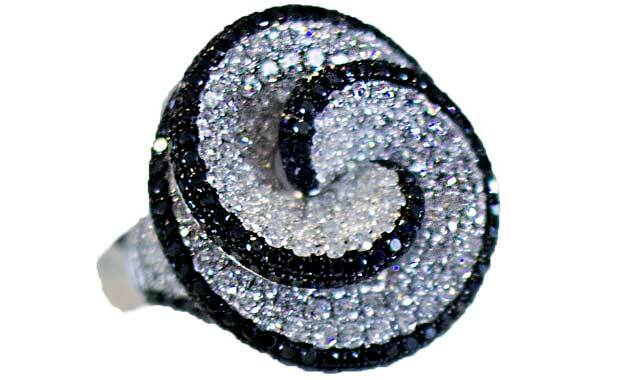 This pave ring contains white diamonds set in 18-karat white and black gold. 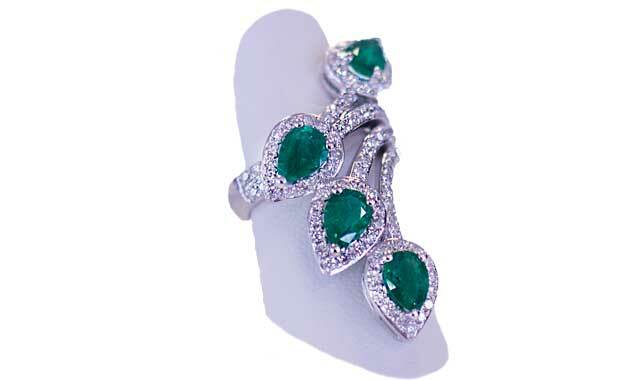 This 18-karat white gold ring features dazzling emeralds surrounded by sparkling diamonds. 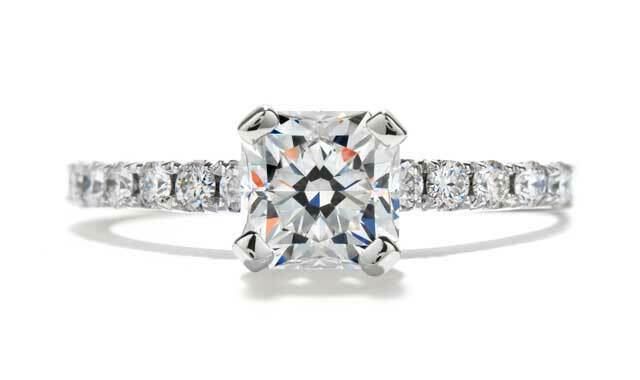 A custom-designed platinum engagement ring, this piece features a round brilliant-cut diamond. 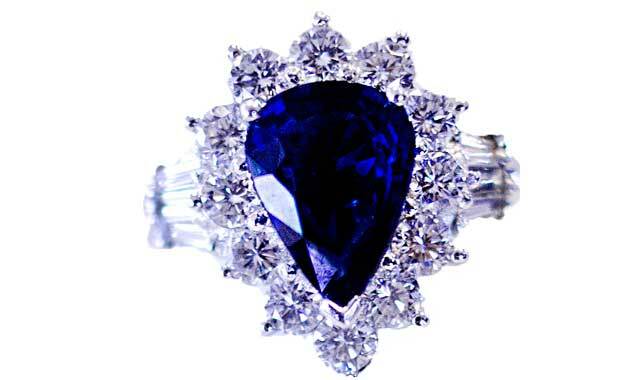 The centerpiece of this 18-karat white gold ring is a shimmering sapphire that’s surrounded by diamonds. “When shopping for loose diamonds, it’s best to always refer to a diamond report. GIA is the most respected grading laboratory. In addition, it’s important to shop around and do your research. This gorgeous necklace has a melange of sapphire colors. 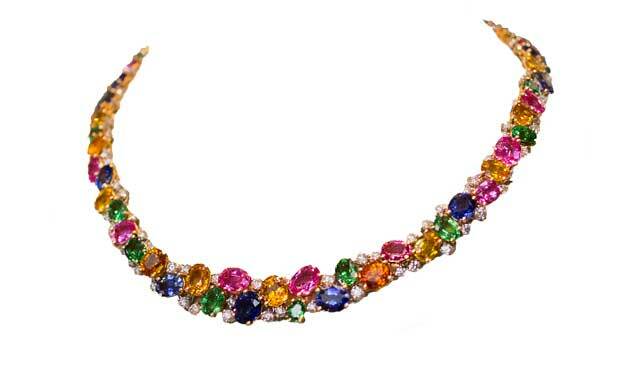 The mixture consists of 16 pinks, 16 orange/yellow and 14 blue stones, with compliments of 18 tsavorite (green) garnet and 112 round brilliant diamonds weighing 9.25 carats in total. Brilliance for the wrist! 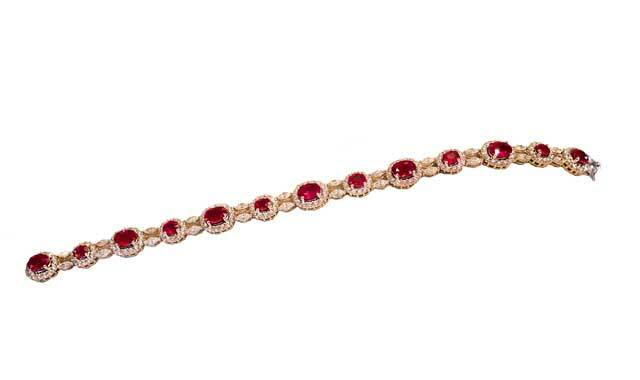 This bracelet features seven large and six small deep-red oval rubies weighing 10.65 carats in total, all wrapped up in 5.65 carats of round brilliant-cut and marquise-cut diamonds. Exceptional from any vantage point, this 5.24-carat Black Opal beauty displays a fiery aurora borealis of colors, including red, orange, magenta, yellow, green and blue. An 18-karat yellow-gold bezel and split-shank pave setting anchor the 308 round brilliant-cut diamonds that accent this Australian treasure. 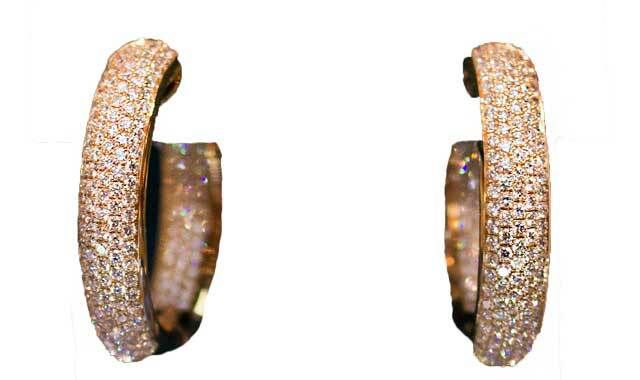 Set in 18-karat rose gold, these “In and Out” hoops are lovingly wrapped in a pave setting of 4.40 carats of meticulously placed round brilliant-cut diamonds. 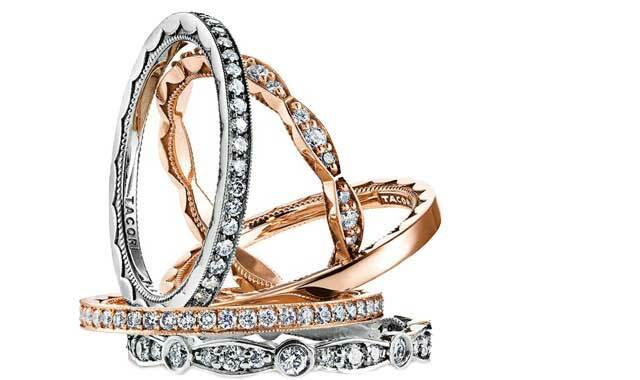 These 18-karat gold bands by Tacori are beautifully handcrafted in California in the trademark crescent silhouette design. Choose any color from rose, white or gold to platinum and more. 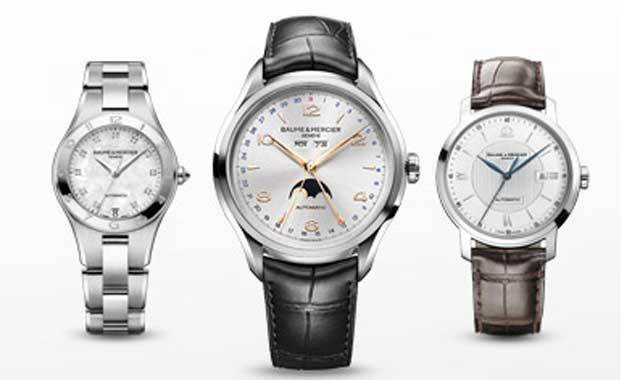 These fine watches are from Baume & Mercier, watchmakers since 1830. Pictured from left to right are the Ladies Linea watch in stainless steel with an interchangeable bracelet, the Gents Clifton watch with a black leather strap and moon face, and the Gents Classima watch with a brown leather strap. 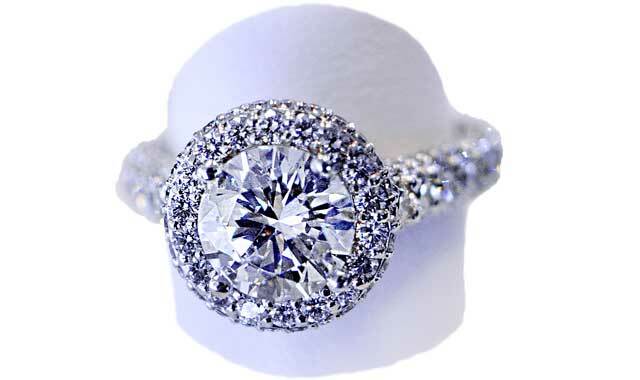 “When making such an important purchase, you should work with a jeweler who listens to your needs. A fine piece of jewelry is something that should give the wearer years of happiness before it’s passed down as an heirloom. By shopping at an independent jeweler, you will receive more-personal care. The people you are working with have a vested interest in making your shopping experience the best. This ring shimmers with the brilliance of a perfectly square Dream diamond – a Hearts On Fire exclusive patented cut. 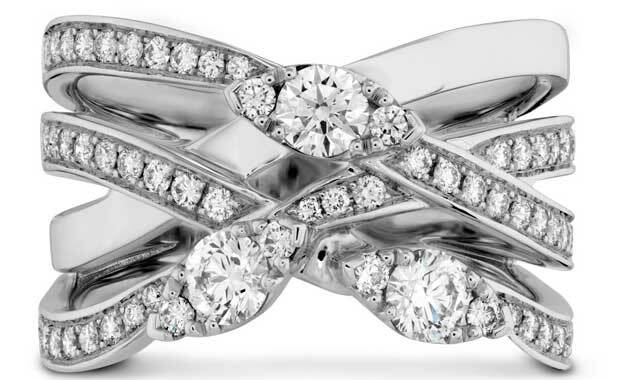 The center stone is set on a delicate band and that holds 20 Hearts On Fire diamonds. 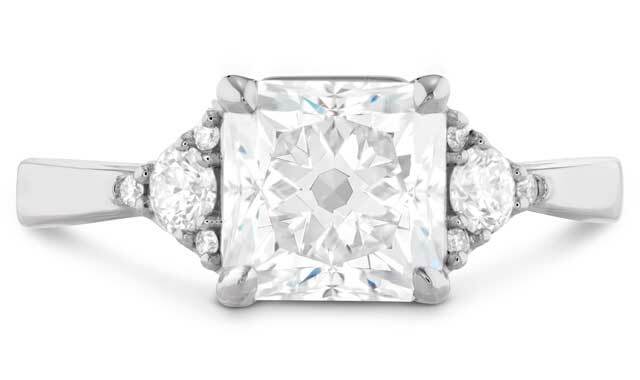 A vintage, square-shaped halo design surrounds a round center diamond in this Transcend Premier Custom Halo Engagement Ring. 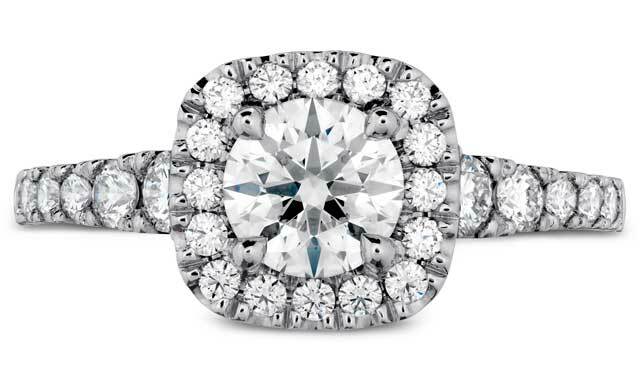 This ring gives the illusion of a cushion-cut diamond, with all the brilliance of a round Hearts On Fire signature cut. This majestic setting holds a large Dream, or square-shaped, center diamond and has smaller diamonds set on either side, creating the illusion of horizontal triangles. This setting is a beauty for the bold, modern woman. “The most important thing to keep in mind when buying a ring is that clarity and color do not make a diamond sparkle. Cut is the single most important element that captures light and returns it to the eye. 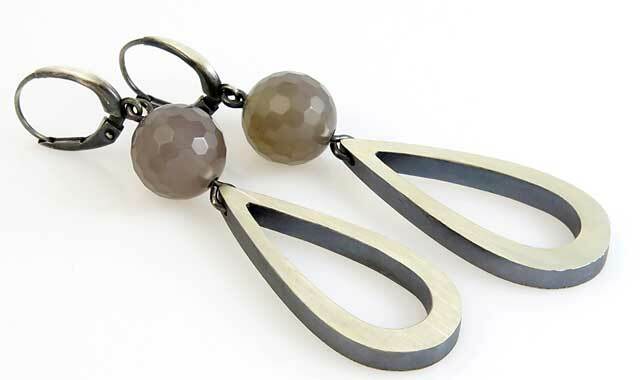 These brushed sterling-silver drop earrings each contain a faceted grey onyx bead. 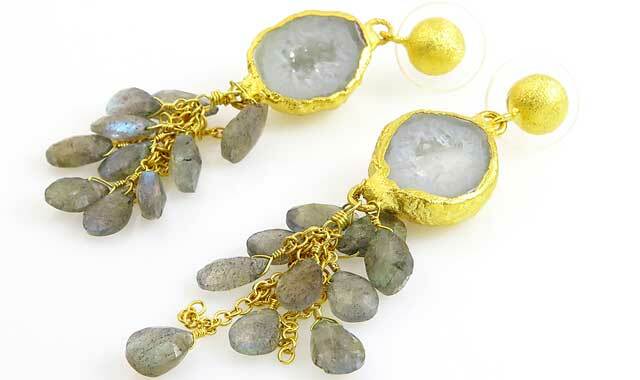 These sterling-silver dangle earrings are coated in 18-karat yellow gold, with two free-form geodes and 20 pear-shaped labradorites. 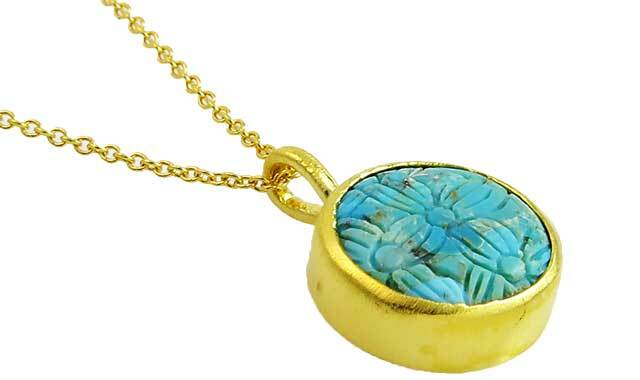 This sterling-silver necklace is set on 18-karat yellow gold, surrounding a turquoise stone. 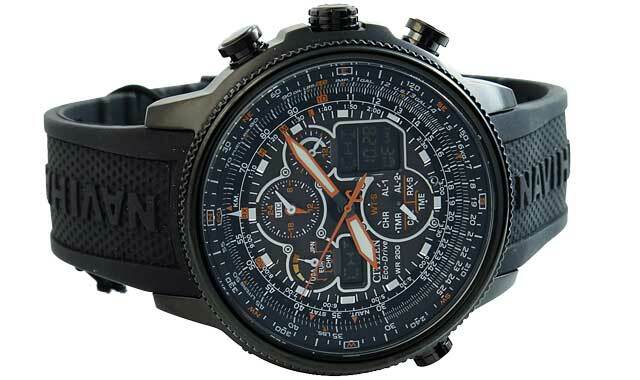 This men’s watch is durable yet classy, with digital displays and a black polyurethane strap. Fueled by light, this watch never needs a battery. This entry was posted on Wednesday, November 25th, 2015 at 12:00 pm	and is filed under Northwest Woman, Top Posts. You can follow any responses to this entry through the RSS 2.0 feed. Both comments and pings are currently closed.